It's pothole season again: that time of year when winter and spring play tug-of-war, resulting in fluctuating temperatures that can wreak havoc on roads. Potholes begin when water seeps through cracks in the road. In colder climates, that water can freeze and push sections of pavement upward. The eventual thaw results in unsupported pockets (in warmer climates, soil erosion under the road can cause weak spots). The continual pressure of vehicles may cause these weak areas to collapse. So, what should you do if you hit a pothole? Don't ignore the issue—the bump can cause damage that may only get worse, Jeff Cox, president of the Automotive Maintenance and Repair Association, says. He recommends pulling over to a safe place and checking out the following parts of your car. Hitting a pothole can be jarring to your tires, Cox says. And if the force is great enough, the sudden shift of air inside the tire can cause the sidewall to blow out. "Think of [your tire] as a balloon," says Cox. "If you keep squeezing, at some point, [the tire] will create its own puncture." If the impact has caused your tire to lose air, the vehicle's tire-pressure monitoring system (TPMS) light will immediately go on. But even if the tire is holding air, that doesn't mean you're in the clear. Look for any bulges sticking out of the side. They could be a sign of internal damage, which means you're probably going to need to replace the tire. "Most of the time, the damage isn't to the tread; it's to the sidewall," Cox says. "And unfortunately, there's no way to patch or plug a sidewall." 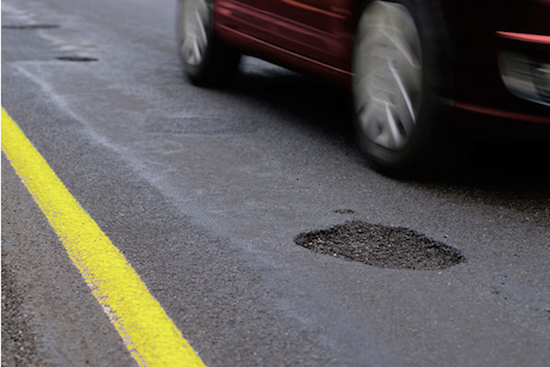 The hard angles of a pothole can also cause serious damage to your wheels. "The first things to look for are bends or cracks in the side of the wheel where the rim meets the tire," Cox says. If a wheel is bent, it won't roll smoothly. Also, the airtight seal between the tire and the wheel could be compromised. "Sometimes, you can see where the pieces have broken off, and the wheel is dented in," Cox says. "If there is visible damage, that wheel will most likely need to be replaced." If you notice your car pulling to the right or the left, the pothole might have bent one or more suspension or steering components out of alignment. Not only will that issue cause handling problems, but if you just had to spring for a brand new tire, a misaligned suspension will cause it to wear unevenly and wear out prematurely. In that case, get your alignment checked. "Ask them to put your car on the machine, and then take a look at the report," Cox says. "If the box is green, you're good to go. If [the box] is red, that means [your tire] is out of alignment. There's no gray area." Fortunately, he says, if your car does need to be realigned, many shops run specials during pothole season. If you're ever stranded on the road, having Emergency Roadside Service (ERS) is essential, and it's available at your fingertips through your GEICO Mobile app. Add ERS to your policy for peace of mind while you drive.